Nature’s Sunshine Anti-Gas, Chinese combines 15 herbs from a traditional Chinese medicine formula. 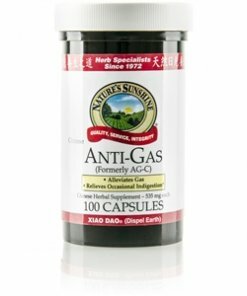 The herbal combination is “earth-reducing,” according to Chinese medicine, and the Chinese name of the formula means “clear the congestion.” Anti-Gas promotes proper digestive and detoxifying function, particularly the functions of the urinary system. The formula, according to Chinese medicine, transports chi, or vitality, to the head and encourages the elimination of excess moisture and toxins.